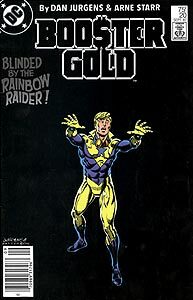 Cover Description: Booster Gold stands, goggles off, blindly reaching out in an otherwise empty, black field. Brief Synopsis: Embarrassed by the Rainbow Raider in front of newspaperwoman Lois Lane, Booster is determined to bring the Rainbow Raider to justice. POWER UP: Booster Gold reveals that he can charge Skeets battery with "a concentrated Booster Shot." Trixie Collins uncovers evidence that Booster has been funneling corporate money into his private accounts. This is the first hint of the money-troubles to come (see in Booster Gold, Vol. 1, #24). Booster jokingly prohibits Dirk and Trixie from calling him "Booster Albino" after the Rainbow Raider has drained all of the color from Booster's costume. Albinos suffer from a genetic deformity causing a lack of pigmentation in their skin, hair, and eyes. Therefore, they appear pale or white, just as Booster currently does, making it an appropriate moniker. Booster again jokes about his lack of pigment, calling it a "Snow White effect." Snow White is a titular fairy tale character named for her exceptionally pale skin. Though most famously retold by the Brothers' Grimm, stories about Snow White have been circulating through Europe since at least the Middle Ages. As Jack prepares to bombard Booster with color in order to rejuvenate Booster's lost pigmentation, Booster calls Jack "Dr. Frankenstein." This is a reference to the mad scientist who re-animated a living being from dead tissue in the classic novel Frankenstein; or the Modern Prometheus written by Mary Shelley. Some consider the novel to be the first science fiction book, a genre of fiction that has evolved over the years to include such media as issues of Booster Gold. Satisfied that his color has returned, Booster now calls Jack "Mr. Wizard," in reference to Don Herbert, a television personality who has appeared on several television shows in the past 50 years. In most of his television appearances, Mr. Wizard challenges some young, inexperienced but eager child to perform a seemingly impossible task before demonstrating a quick and enjoyable lesson about science in completion of the task. The Rainbow Raider is holding the Metropolis Art Institute hostage, demanding Paul Morris in exchange. The police are considering cooperating in order to save the "art treasures" inside the museum. Only in Metropolis would the police think it was a good idea to sacrifice the life of a man to a psychopathic villain for the sake of art. 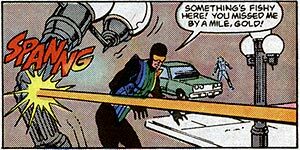 The man leading the police, Lt. Stone, is presumed to be the same officer as Detective Stone, shown as far back as Booster Gold, Vol. 1, #10. This is the first time that he and Booster have appeared at the same crime scene. In order to save his public image, Booster is literally fighting blind with the aid of Skeets, endangering the lives of innocent bystanders. While this brash and dangerous behavior is common for Booster, Skeets should know better than to participate. Booster estimates his net worth at $100 million. By comparison, in 2002 Forbes magazine estimated Bruce Wayne's wealth at over $6 billion dollars and Lex Luther's at $4.7 billion. Skeets argues Booster's claim as the "World's Greatest Super-Hero." In response, Booster compares himself to Batman and Skeets to Robin, in yet more evidence of Booster's hero-worship of Batman. The fire at the museum qualifies as news valid enough for local television stations to interrupt their rerun of Gilligan's Island, disturbing a Metropolis citizen. Gilligan's Island was originally broadcast on the CBS network from 1964 to 1967, so anyone watching syndicated reruns in 1987 shouldn't be too concerned about missing any important developments by the news preemption. In order to get even with Peter Cochran for slurring his image, Booster has B.G.I. acquire United Mutual and fire Peter Cochran. Boosterrific Review: If this story had appeared in the Silver Age, no one would have batted an eye at the fact that Booster Gold has lost all of his pigment and is now a human outline. However, the concept does not work quite so well when the hero is a 1980s corporate raider (a fact completely relevant to a subplot of this issue). Probably more damaging to the book are Arne Starr's imprecise inks. Starr's cartoonish figures offer a poor follow-up to Al Vey's work in the previous issue and accentuate the ridiculous nature of our hero's predicament. All that being said, we cannot help but enjoy this issue. Perhaps we're just too fond of the high camp of the Silver Age, but there's something endearing about an exuberant comic book character named Booster Gold struggling to overcome being transformed into a dour Booster Black and White. Throw in a fight with a frustrated artist amidst an art museum fire (started by the color red! ), and you get a comic that is just too fun to dislike. We wouldn't want to make a steady diet of this sort of story, but it makes a fantastic guilty snack between meals. Again, I enjoyed this story better than I thought I would, though there's some real Saturday morning camp spread throughout this issue. Still, we ARE reading comics about superheroes in tights with superpowers, so I can pretty well overlook anything dealing with "camp." Sniff...well there goes my Trixie as Goldstar on a permanent basis dream. This one is a bit too goofy for my tastes. And Michelle should have fought the Rainbow Raider-I mean she has no color to lose, right? They brought her from the future and have no clue what to do with her....and we'll see this again in 20 years.